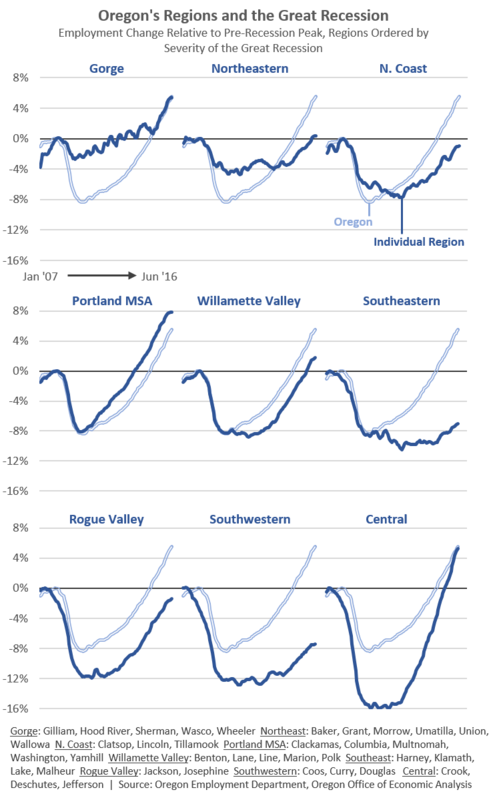 Just a quick update on regional employment in Oregon over the past decade or so. Right now five of the state’s nine regional economies — per our office’s groupings — have regained all of their Great Recession job losses and are currently at all-time highs for employment. Two additional regions are nearly there and will be in the coming months. The two nonmetro or rural regions in the southern half of the state are recovering today but still have a long way to go to regain all of their lost jobs (more on that in a minute). While the actual number of jobs matters a lot, what we also care about is employment relative to the population. Are there enough jobs for everyone? That is why our office continues to use demographically-adjusted potential labor force figures to gauge the Jobs Gap. This looks at employment relative to the size of the population that would likely be working or looking for work if the economy was firing on all cylinders or at full capacity. The key technical point here is that it adjusts for the aging Baby Boomers as they are entering into retirement in greater numbers these days. In terms of the Jobs Gap the state overall just last month finally has added enough jobs to catch back up with population growth since the onset of the Great Recession. Two other regions — the North Coast and the Portland Metro — have also closed their Jobs Gap. Two additional regions — Northeastern Oregon and the Columbia Gorge — are close. The remainder of the state has larger Jobs Gaps but they are closing as the economy improves. Central Oregon in particular is seeing robust gains — Bend is adding jobs at a 6-8% annual pace — but given the severity of the Great Recession and the fact that the population continued to increase, the Jobs Gap has yet to fully close. Just a reminder of how the aging demographics can impact the potential labor force. In rural Oregon in particular we know the potential labor force has been shrinking and in some places will continue to for a few more years. However much of this adjustment has already occurred. Demographics are not expected to weigh on the rural economies nearly as much moving forward, if at all. However, as an example, the Jobs Gap can close both from more jobs and also a smaller potential labor force. 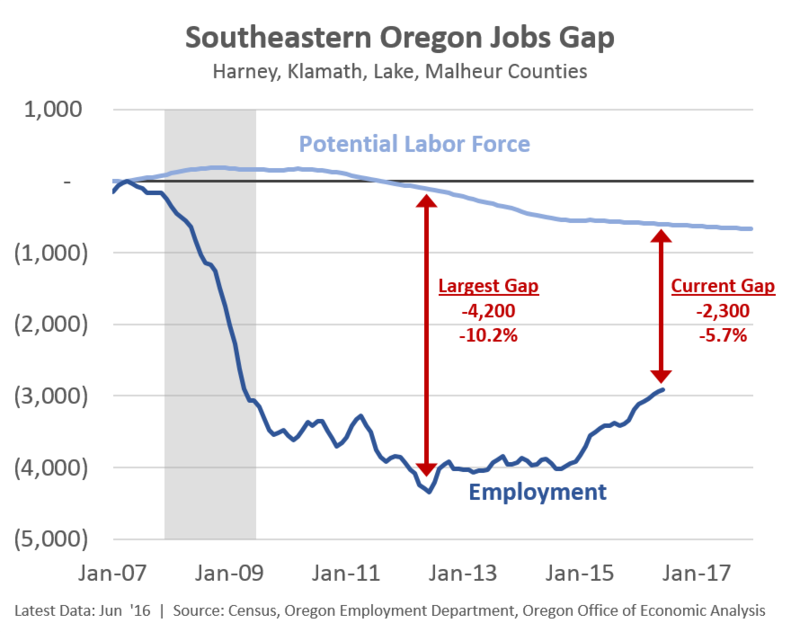 So far in Southeastern Oregon the gap has fallen nearly in half since the worst of the Great Recession and its aftermath. This improvement has come, roughly, three-quarters due to employment growth and one-quarter due to the smaller potential labor force. Overall the economy continues to improve. The majority of the state is seeing a record number of jobs and the growth is finally catching back up to accommodate all the new residents and workers over the past decade. This is certainly good and welcomed news. 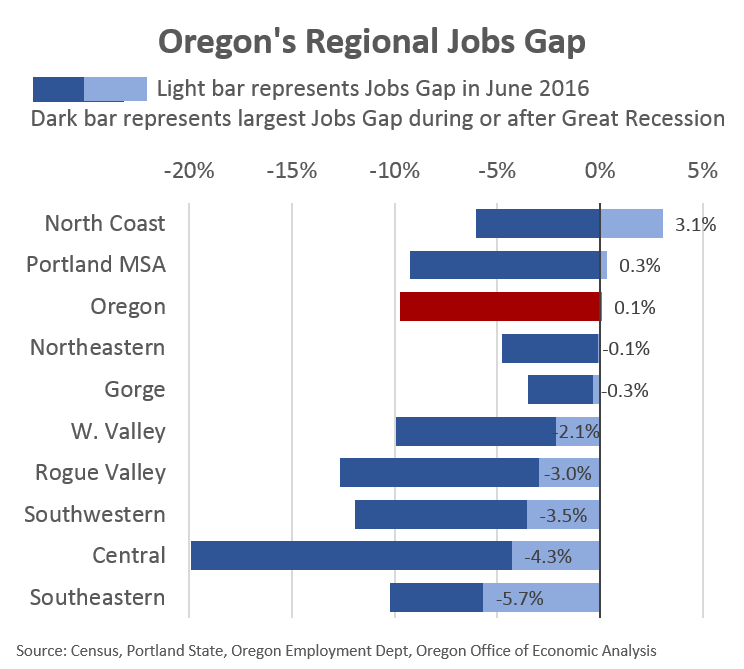 Even so, the recovery continues to be uneven with rural Oregon, particularly southern counties, still facing the largest Jobs Gap in the state. Growth has returned, these regional economies are on the mend, but further progress is still needed.